When it comes to the exploitation of forests and mineral resources, the Solomon Islands is PNG on steroids. It is a window into our future if we fail to stop rule by mobocracy. Plunder, environment destruction, and corruption, these are the familiar trio of evils faced by the Solomon Islands. This remote tropical island in the Pacific ocean has been laid to waste by years of uncontrolled logging and mining, surrounded by the heavy stench of corruption. This is despite the eastern third of the island being placed on a UNESCO World Heritage Danger List in 2013, in part because of the threats posed by logging and mining to its unique biodiversity and ecological values. 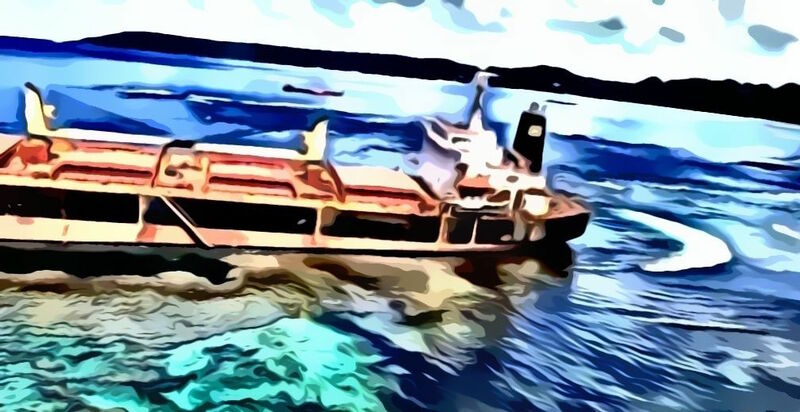 In the latest episode of this ongoing tragedy, in the early hours of February 5, a ship collecting bauxite from the island ran aground on coral reefs. It began leaching more than 75 tonnes of heavy fuel oil just metres from the shore. The Solomon Trader has leaked 75 tonnes of heavy fuel oil into the sea and is still stranded on a coral reef just metres from the shore. In the weeks after the ship ran aground the international community, led by the Australian government, was strident in its criticism of the mining company, the ship owners and their insurers for their lack of interest in doing anything to control the unfolding environmental disaster caused by the leaking oil. Behind the outrage lies years of illegal natural resource exploitation on Rennell Island led by foreign businessman, including an Australian citizen. All of which began while the nation was under the custodianship of hundreds of Australian Federal police posted to the Solomon Islands as part of Australia’s $2.6 billion regional assistance mission. A PNGi investigation into this scandal has uncovered facts that echo our own experience – it is a tale marked by dysfunctional government departments undermined by corrupt businessmen and greedy, self-serving politicians all under the watchful gaze of an international community more concerned with its own economic interests than the plight of local people. 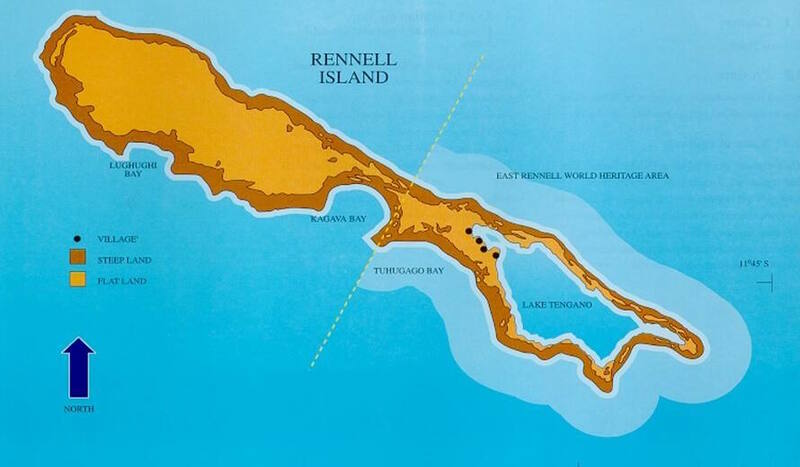 Just eighty kilometres long and fourteen kilometres wide, Rennell Island is the world’s largest raised coral atoll. It lies on the south western fringe of the Pacific ocean and forms part of an archipelago divided up into different nation states by European colonialists who laid claim to the region during the 18th and 19th centuries. While Bougainville to the north became part of Papua New Guinea, Rennell along with more than 900 other atolls and islands became the Solomon Islands. Although the Solomon Islands was notionally granted political independence in 1978, foreign exploitation of the region for cheap labour and agriculture, which began in the mid 1800’s, has continued unabated. Logging and mining are the most recent incarnations of colonial economic power, under which most of the region continues to operate. The Solomon Islands is richly endowed with tropical rainforests. Like PNG, these forests fulfil a crucial role ensuring the economic, social, cultural and environmental wellbeing of rural communities. However, in 1981, Prime Minister Solomon Mamalona removed controls the large-scale logging of Solomon Island forests. Professor Matthew Allen observes in The Political Economy of Logging in Solomon Islands, removal of these controls left ‘unscrupulous loggers to directly engage with naive, or in some cases conniving, customary land group representatives’. It also transferred power from government officials to politicians in ‘a woeful tale of corruption, greed, profligacy, patronage, tax avoidance, maladministration, incompetence, and environmental destruction’. According to Global Witness, almost forty-years on, logging is continuing to lay waste to most of the Solomon Islands’ (SI) forests. In 2017, the nation exported more than 3 million cubic metres of logs. This is more than 19 times a conservative estimate of the annual sustainable harvest. According to Global Witness, a recent report from the SI Ministry of Finance suggests that if logging activities continue at their current pace, natural forests will be completely exhausted by 2036. The continued rapacity of the logging industry has not prevented the rise of a new form of natural resource exploitation in the Solomon Islands, that is foreign led and owned. Many predict mining is poised to take over the country’s economy. It is a shift that academic Graham Baines has warned threatens a move ‘from one unsustainable, environmentally destructive and socially disruptive resource-development base to another’. On Rennell Island though it seems logging and mining have been proceeding hand in glove. This is because the main mineral resource, bauxite, occurs in shallow pockets all across the island. This means that ‘mining’ is much more akin to quarrying. Small shallow pits are dug using excavators. The earth is then ferried to the coast for loading onto ships for export. Image: A typical bauxite mining site on Rennell Island. Credit /Ripples in Rennell. This is not only environmentally disastrous, as academic Daniel Evans has pointed out, it means the island’s only arable land is being scooped up and shipped off-shore. The valuable food gardens of future generations’ are vanishing. But, for foreign-owned logging companies prospecting for bauxite has provided a perfect cover for tree felling operations. Before an area can be sampled for bauxite, long winding roads must be bulldozed through the forest. Any selected sites must be cleared of trees. 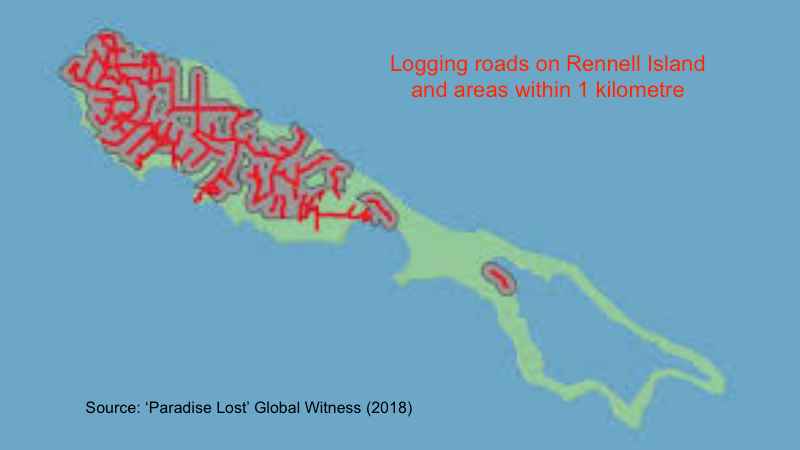 Image: Satellite analysis published by Global Witness showing the extent of logging roads on Rennell Island (the unlogged portion is a UNESCO World Heritage site). The courts have declared such logging illegal, but with little seeming impact. In a 2015 High Court case, Asia Pacific Investment Development Limited (APID) – which features large in this report as a company at the centre of the bauxite mining on Rennell – was found guilty of illegal logging. APID claims its logging operations were conducted under its bauxite Prospecting Licence. The company contends it needs to clear forest in order to construct access roads and clear the land for mining. However, the court found that APID still needed a felling licence, which in fact it had unsuccessfully applied for twice. APID was ordered to, stop its logging operations, and pay any monies received from the export of already felled logs into a neutral account, awaiting further court hearings to determine who it should be paid too. There is no evidence though that this prevented further logging. This was also not the first time APID and its then owner, the Australian Raymond Chu, had run foul of the Solomon Islands courts. In 2012, APID and Chu were found guilty in another case of illegal logging. Chu was fined $5,000 for breaching court orders to stop the logging. He was ordered to pay any income received into a court fund. APID is also not the only company that has been logging on Rennell. Indeed, one 2015 court case concerned a parcel of land where no less than 11 logging companies were operating! In another instance, during September 2014, it was reported that a single logging company had exceeded the annual log quota for the whole island in just a matter of months. The company was also accused of ignoring a notice ordering, the seizure of its equipment and 11,000 cubic metres of logs, imposed for logging outside concession boundaries. Court documents, and media reports, reveal a chaotic history of mining on Rennell Island over the past five years. Two companies have been locked in a battle for bauxite rights. Laws and regulations have been cast asunder as both seek to win the favour of local people and national politicians. It appears Asia Pacific Investment Development Limited (APID) was the first company granted a mineral prospecting licence on Rennell Island, in 2008. That licence was then extended in 2013. But in 2014, another company, PT. Mega Bintang Borneo Limited, entered the fray. In May 2014, an MOU was announced between Bintang Borneo and the four landowning groups on Rennell island. Under the MOU Bintang Borneo was granted permission to begin establishing infrastructure on the island as a precursor to mineral exploration activity. The company’s delegation to the island was led by a politician, the Provincial Premier, Lence Tango. Within months of Bintang Borneo signing its MOU, it was reported both APID and Bintang Borneo had been issued with mining leases, leases with overlapping boundaries. Later litigation revealed Bintang Borneo was granted its prospecting licence in June 2014 and its’s Mining Lease just three months later, in September 2014. To move from exploration to mining within such a time-frame is unusual. Certainly, the Solomon Star newspaper was not impressed with the process being used by either company. It accused them both of ‘using senior landowners in their quest to mine the island’. During December 2014, the newly elected government of Prime Minister Manasseh Sogavare, stepped in to seemingly resolve the dispute. Despite the Prime Minister’s pledge, however, it seems the prospecting licence and mining lease were not cancelled for another three months, until March 23 2015. In the meantime, Bintang Borneo carried on mining, allegedly in areas also covered by APID’s lease. This was described as a ‘criminal offence’ by the Ministry. The Ministry also rejected an application by Bintang Borneo for an Export Permit and instructed the company to halt all operations and remove all its equipment. This was far from the end of the saga. Three months later, it appears the government relented and Bintang Borneo was granted permission to export its stockpiled bauxite (and pay a 20% export duty). This move by the government appears to have been in breach of the law. In August 2013 the High Court found an export permit could not survive the confirmation of the cancellation of a mining lease. Meanwhile, it later emerged that APID may not have been an innocent bystander while the government was taking action against its rival. In August 2015 it was alleged that following the original announcement of the cancellation of Bintang Borneo’s lease, in January 2015, APID subsidiary, confusingly named Bintan Mining, paid for a chartered flight worth $44,000 to investigate the boundaries of Bintang’s lease. Onboard the flight, were the then Minister for Mines Peter Auga, the deputy director of Environment Tia Masolo and the speaker of Renbel province Dicter Maitaki, described as a ‘staunch supporter’ of APID. In any event, APID was itself struggling to hold on to its mining lease, which had allegedly been rushed through without necessary landholder consultation. On 7th May 2015, APID was given fourteen days notice for the cancellation of its mining lease over a failure to meet conditions required by the Mines and Minerals Board. It was also revealed the government had not negotiated royalty payments for any of the three shipments of bauxite already exported by APID. APID responded to its lease cancellation notice by issuing court proceedings. Within weeks there was another surprising twist. Despite the mining lease standoff, in June 2015 it appears APID was given a ‘registered grant to profit’ and sublease over a parcel of land No.289-005 on Rennell Island. Unfortunately though for APID, no less than 11 logging companies already held felling timber licences over the same portion of land. When APID tried to remove these companies, the High Court refused its request. The court concluded that the logging companies’ rights preceded those acquired by APID. It was also observed, APID must have known the logging companies were already operating on the land before it took its grant and sub-lease. The following month, July, APID was in more hot water, this time with the Ministry of Forests. APID was accused of using its mining lease as cover for an illegal logging operation. A notice to stop a log shipment and immediately halt any logging operations was issued by the Ministry of Forestry. The Ministry claimed APID did not have a felling licence or log export permit. APID hit back, by ‘claiming a ten-year caveat’ over all mining tenements on Rennell, which it said, doubled the size of its mining lease area from 31,000 to 61,000 hectares. Apparently unimpressed by the central government’s inability to take decisive action against APID, the Renbel provincial government tried taking its own action. In September it cancelled APID’s Provincial Business Licence. This meant APID was barred from carrying out any business transactions or operations in the province, including on Rennell island. Unsurprisingly, APID responded with another legal challenge. In November, APID obtained an interim injunction suspending the cancellation of its business licence pending a judicial review. Meanwhile, the government in Honiara had also been busy. In November it obtained its own High Court orders preventing APID from entering its lease areas on Rennell Island and from carrying out any mining activity or exporting or selling anything extracted from its mining areas until APID’s claim against the Show Cause notice was determined. While the final outcome of these various court proceedings is not known, or indeed whether they are still ongoing, APID did at some stage resume its mining operations. This is despite separate court proceedings launched by local landowners challenging the legality of the original mining lease granted to APID. corruption is evident in the bauxite mining that has been taking place on Rennell, with extensive allegations of bribes and inducements being paid, by two rival companies, to landowners and relevant national authorities, and the direct involvement of politicians in corrupt dealings. But the allegations of corruption do not stop here. Strangely, it appears APID and Bintang Borneo are not the only companies granted competing bauxite mining leases on Rennell island. In September 2014, just four days after the grant of a Mining Lease to APID, another company, Worldlink Resources Ltd, was issued with a prospecting licence over an area that was wholly within APID’s Mining Lease area. Five months later, in March 2015, the Mining Minister granted Worldlink Resources Ltd a full Mining Lease. This was despite APID already having exclusive rights for a term of 25 years. In February 2016, APID obtained court orders. They restrained Worldlink from undertaking any mining activity and ordered the company to withdraw all its plant and machinery. Worldlink Resources Ltd is owned by the Hong-Kong registered, CEN-Prosper Worldling Resource (Holdings) Limited. It was removed from the SI Company Register in March 2019 for failing to file its Annual Returns. The company had two directors, Malaysian national, Lee Kheng Hin, and Chinese national, Yu Yao Gen.
Further evidence of the close relationship between the resource extraction companies operating on Rennell Island and those in political power, emerged in 2017. During January 2017, text messages between the Prime Minister and Bintan/APID officials from November 2016 were circulated. They showed the PM’s personal guarantee being granted that export duty exemptions would be issued for APID’s bauxite shipments. That exemption was duly gazetted in December 2016 and backdated to August. Then, in April 2017, a late-night meeting in a hotel carpark between APID owner, the Australian Ray Chu, and the then Minister for Mines, David Dei Pacha, was secretly recorded on video. Pacha later became the Speaker of Parliament. The following month the Prime Minister Sogavare wrote to the General Manager of Bintan Mining, praising the company for its ‘good corporate citizenship’ in the face of the many challenges it had endured. The PM noted the company’s ‘noble aims and objectives’ which were ‘worthy of emulation by other mining operations’. He promised a ‘closer working relationship’ in the future’. The PM claimed, in his defence, that it was normal practice for him to write to ‘investors’ when he received positive feedback from stakeholders. Although a media report on February 13 revealed the Solomon Trader had grounded on a reef, there was no mention of any pollution issues. It wasn’t until later in February that the world was alerted to the environmental disaster unfolding on Rennell Island, within sight of its UNESCO World Heritage protected area. The MV Solomon Trader had been loading bauxite from barges floated out from the shore in the waters of Kangava Bay when it was blown onto the coral reef on the night of February 4 /5 in high winds generated by cyclone Oma. For three weeks, locals watched as the stricken 225m long tanker leaked more than 80 tonnes of heavy fuel oil into the azure waters of the marine sanctuary, poisoning their vital fishing grounds. The Hong Kong flagged ship was on charter to Bintan Mining, and was loading bauxite for shipment to China. Bintan and its reported owner, APID, initially denied any responsibility as the ships charterer, either for the vessel or the spill. Locals questioned though why the company had continued loading the ship, using its own barges and equipment, when the cyclone warning had been well known. They also alleged, the day after the ship ran aground, Bintan dumped the bauxite on its barges into the sea. Bauxite contains a high content of aluminium hydroxide, iron oxide and chromium, which are all poisonous to marine life. The Australian government promised to help hold the company, owners and insurers to account for the damage. Additionally, the Solomon’s own interim Prime Minister, Rick Houenipwela, also talked tough, threatening to put the companies involved on an international blacklist. 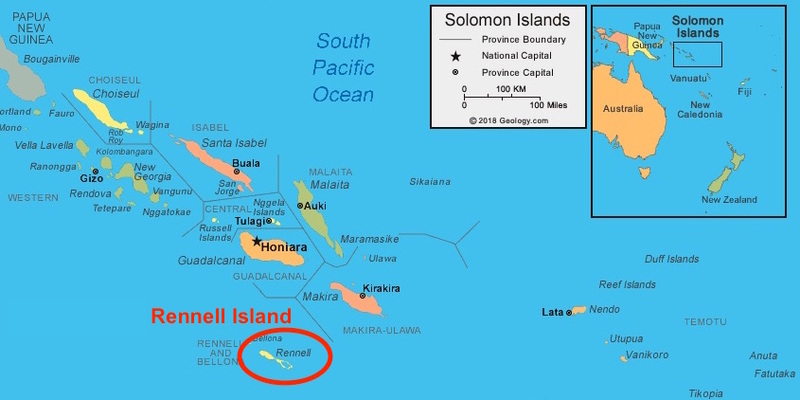 In general though, the Solomon Island’s political elite have been silent. There has been no comment from the either the Minister for Mines or the Minister for the Environment, even as Bintan and APID continue mining and even load a new shipment of bauxite right alongside the stricken Solomon Trader. The unfolding disaster on Rennell is a perfect case study in rapacious natural resource exploitation, poverty and weak governance. And the deafening silence within Solomon Islands is perversely rational. Solomon Islands’ politics is highly localised: direct relationships of MP-voter patronage dictate everything. It is characterised by widespread corruption, fuelled by the country’s Asian-dominated logging, and now mining, industries. (There is a blurring between the two, as one-time loggers turn their hand to mining.) Political and bureaucratic elites collude with third-rate companies whose definition of corporate social responsibility is to build a public road to a mining site. Environmental laws are disregarded, either deliberately or because public servants lack the ability to enforce them. It has even been reported that on 8 March, just one day after the Prime Minister threatened to put Bintan Mining on an international blacklist, the company was issued two new mine prospecting licences. The licences, reported to have been confirmed by the Director of Mines, Nicholas Biliki, are on the islands of Isabel and San Jorge in Isabel province. Meanwhile, although mine workers claim they have gone unpaid since the disaster, it is the local people who are the real victims. They feel abandoned by their government and the international community. Locals say the black tar on their beaches is just the latest evidence of a wider problem – a largely unregulated mining operation that’s plundering their resources. According to a media report, Bintan Mining is registered in the British Virgin Islands while ’its parent’, Asia Pacific Investment Development, is registered in Hong Kong. Due to the veil of secrecy that surrounds BVI company registrations it is impossible to confirm the link. PNGi has though been able to establish there is a Bintan Mining Corporation, incorporated in BVI, registered in Hong Kong as a ‘foreign company’. 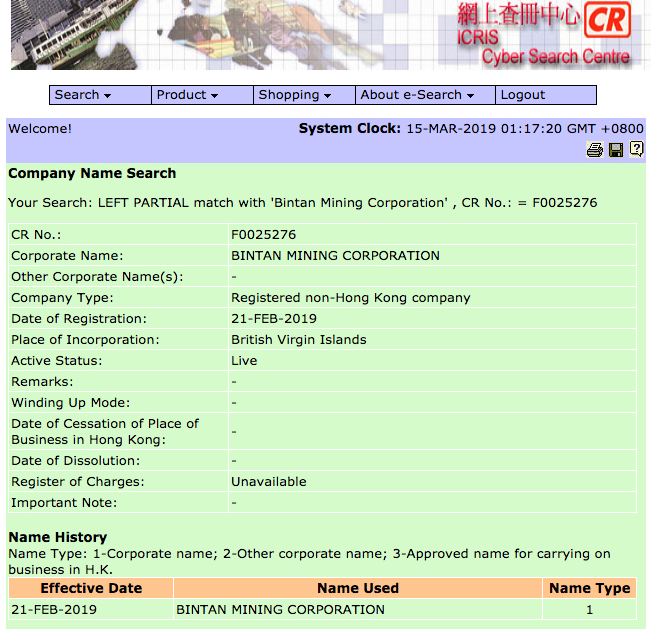 Bintan Mining Corporation was only registered in Hong Kong in February this year (2019). Company records in the Solomon Islands however, show a rather different picture. According to the SI Business Registry, Asia Pacific Investment Development Limited is a private company first registered in 2008. Since 2017 the 100 issued shares have been owned by Rachel Fasifera (99%,) and Rose Mona (1%). The previous owner was the Australian Ray Chu, who is still listed as a company director and contact point. Rachel Fasifera, the current owner, is Raymond Chu’s wife. From the official records, Australian Ray Chu also seems to share Malaysian and Solomon Islands citizenship. He is variously listed as an investor and / or director in several SI registered forestry, agriculture and retail / wholesale businesses. APID’s main area of business is listed as “forestry” and Rachel Fasifera is also listed as the owner of a second forestry company, Prestige Timber SI Limited (the company’s registration application was submitted by her husband). She also owns the Rayna Cafe business name, Easyseafood (SI) Limited (also originally registered by Chu) and the agriculture company, Linc Corporation Limited (which was also previously owned by her husband). Bintan Mining SI Limited is registered as a foreign owned company. Official records list the Bintan Mining Corporation as the owner. This follows a change in the shareholding in December 2017. The former owners were Patrick Man Kam Wong (60%) and Chi Kin Leung (40%). Both were listed as citizens of the United Kingdom. While some media have reported that Bintan Mining is owned by APID, in a 2015 court case, Bintan Mining SI Ltd was described as a contractor engaged by APID to undertake mining operations. Nevertheless, Bintan Mining SI and Asia Pacific Investment Development share the same postal address. As stories start to emerge of the human costs as well as the environmental devastation caused by the Solomon Trader disaster, it is folly to think anything is going to change as a result of last weeks National elections. Social services are weak, productive businesses are impeded by dysfunctional government departments, and corrupting businesses render some government departments dysfunctional. Politicians who should be improving ministries when they are ministers, or holding the government to account when they are in opposition, are caught up instead in endless political wheeling and dealing, and often end up tainted by money politics. The history of logging and mining on Rennell serves as a perfect study of just how deep that dysfunction runs. It has relevance to PNG. As our own easternmost province, which sits on the Solomon Islands archipelago, ponders the question of independence, its political elite champion the very economic model destroying communities across the rest of the archipelago chain. Funded, of course, and championed, by the Australian government and World Bank. As foreign companies loot the region, and toss political leaders coin, rapid deforestation, land deprivation, and pollution, will leave future generations holding a beggars bowl. It is hard to imagine that a gift handed down by a thousand generations may be despoiled in just one. 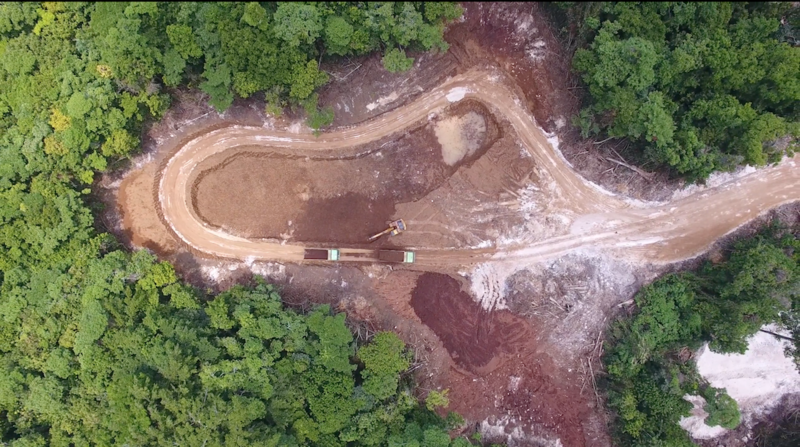 Ripples in Rennell is a film that explores the local issues that the island and its people are facing as a result of the current logging and mining activities. The story is told through the voices of local residents. The film highlights the social, cultural, economic and environmental challenges. The film’s maker, Adam Stewart Hogg, says he produced the film as a case study to be presented to other resource rich islands in the South Pacific, in the hope that this story will not be repeated elsewhere. He is currently working on a follow-up film and recently re-visited the island.